We've started playing Final Fantasy XIV: A Realm Reborn on the PS4 here at Short Pause, and we want to tell you, our fair reader, all about it! Every copy of A Realm Reborn comes with a free 30-day trial of the subscription based MMO, and we intend to put ours to good use. Over the next 30 days, we intend to chronicle our exploits in the land of Eorzea in explicit detail, regularly updating you of our progress and where we stand, before eventually delivering a verdict as to whether it's worth it to start paying for this game via a monthly subscription and continuing to play. Today, Taz needs your help. Please help me. I don't know what I should do. It's been 22 days since playing Final Fantasy XIV: A Realm Reborn and I feel like I have more questions about the game than I did when I was creating my character on day one. Where should I go? What should I do? Whom should I join? When last we spoke, I was in the city of Ul'dah, an amateur pugilist, and had never traveled far from home. I'd recently received an air pass after reaching level 15, and was allowed to travel the entire world of Eorzea. There's a reason why Final Fantasy XIV is called a "Massively" Multiplayer Online Role Playing Game: the world is large and there are so many places to go and things to do. That's why I can't decide what to do next. In my hometown of Ul'dah, there are plenty of things to see and do. If you want to be a pugilist, like me, this is where you want to be. Your story begins with a focus on training you to become a Pugilist, but shifts its focus to training your guild master to become a better Pugilist. If that story doesn't interest you, we also have guilds in Ul'dah for Thaumaturges, Gladiators, Goldsmiths, Miners, Weavers, and Alchemists. Please note: when creating your character for the first time, if you choose to be a Thaumaturge, Gladiator, or Pugilist, Ul'dah is where your story will begin. I spent most of my time in Ul'dah as a Pugilist, but decided to also become a weaver so I could make my own clothing. I tried buying clothes from the market, but got a lesson in humility instead. Everything costs so much money, and amateur pugilists don't seem to make a lot of cash — at least, I don't. I mean, I had a pretty good right hook, but it just wasn't paying the bills. So, I figured I needed to get a second job. Besides, boxing and weaving go together, right? Not quite. Weaving turned out to be more fun than it was worth. I was having a blast doing it, but I wasn't making a big profit. It was more like a favorite hobby than it was a job. Most of my money was going into materials - not into the bank - and I seemed to be running low on both. In particular, I needed lightning shards to begin the weaving process, but their market prices were in the ballpark of "lifetime of debt" figures. So, when someone suggested I become a miner and gather my own materials, I signed up at the local Miners Guild and got my very own pickaxe. But as I stood there, pickaxe in hand, a children's rhyme popped in my head and I decided I needed to step back and think things through. Flying aboard an Air Ship. I know an old lady who swallowed a fly. Imagine that! After catching a flight to Limsa Lominsa, Ul'dah's neighbor to the west, I was surprised to see quite the opposite of what I was used to back home. While Ul'dah is a desert city full of little cacti and little people (Lalafell), the port city of Limsa Lominsa is full of big boats and big people (Roegadyn). In Ul'dah, I see a lot of turbans and robes. In Limsa Lominsa, I see a lot of eye patches and pirates — and I like Pirates. I wonder if any of the city's Free Companies have pirate names. Pittsburgh Pirates? Pirates of the Caribbean? Strawhat Pirates? The Ammazon in Limsa Lominsa. What I do know, is that Limsa Lominsa is home to the Arcanists Guild, Marauders Guild, Fishermans Guild, Cullinarians Guild, Armorers Guild, and Blacksmiths Guild; If you want to join any of those, Limsa Lominsa is the place to be. My two buddies, Donner Kohl of the Arcanists Guild, and Kandy Kane of the Marauders Guild, call Limsa Lominsa their home, and I've been there quite a few times when visiting them. If you want to know more about the city, try looking them up in Malboro (or here on ShortPause). I think it's a nice city to get lost in, as far as getting lost goes. Have I told you that the map in Final Fantasy XIV: A Realm Reborn is atrocious? If you go there, I recommend going with a friend who knows the place, or getting yourself a better map. Here's a map I found that I think is pretty awesome. On the other end of the world, to the east, lies Gridania - and yes, the world is flat. Gridania is very green and wooded, and I've only been there enough to describe it as a big cottage in the forest. Hypothetically, if I could build a real home in any of the three cities, I think I'd build one here. 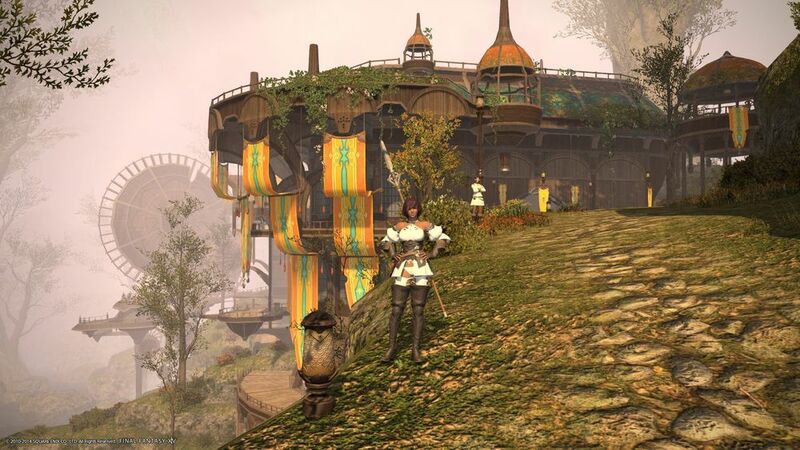 Gridania looks really cozy, and is the home of the Conjurers Guild, Lancers Guild, Archers Guild, Botanists Guild, Leatherworkers Guild, and Carpenters Guild. Of all the guilds in the game, two of these interest me the most. In Final Fantasy XIV: A Realm Reborn, there's a complementary way that Character Classes work together. Choosing the right two classes for your character grants you a bonus you wouldn't otherwise receive. Although I've yet to do it myself, I know which classes go with a Pugilist: Lancer and Archer. Currently, my character is a level 27 Pugilist, and I read online that once I reach level 30, I can become a Monk — if I first become a level 15 Lancer. I don't know anything about Monks or Lancers except that the Lancers Guild is located in Gridania. On the other hand, I can become a Bard if I learn Archery to level 30, since I've already mastered Pugilism beyond level 15. I know nothing about Bards or Archers, except that the Archers Guild is also located in Gridania, so it looks like I should be heading there, regardless. If you have any insight as to which job is more enjoyable, please let me know. Either way, I guess I'll wait until I reach level 30 as a Pugilist before I decide, since I'm so close! "It has to do with your bonus EXP for being rested. When u are in a sanctuary u get the rested status." I'd also like to ask, "What's the fastest way to level up? Should I participate in more FATE's? Maybe I should do more quests. Or should I sign up for Levequests? I have a Hunting Log that gives me a lot of experience. Should I be hunting? What about dungeons?" but that might be too many questions for one person. Dungeons are a new thing for me. They became available during the process of completing main story quests, and require 4 people to attempt. Now that I've defeated a couple dungeons, I feel like this is what Final Fantasy is supposed to be. It's not that I haven't been enjoying everything up to this point — because I have enjoyed it — but joining a team to conquer a dungeon is more reminiscent of a single player Final Fantasy game...but in a multiplayer way. See, I've loved Final Fantasy since Final Fantasy VI, and although I've never beaten that one, between Final Fantasy VI, VII, VIII, IX, X, X-2, XII, and XIII, I've probably logged enough hours that I could have done some truly remarkable things, instead. HowLongToBeat.com calculates it would have taken me around 800 hours to beat all of those games, excluding Final Fantasy 6, and I know I've beaten parts 7 and 8 twice, at least! Anyhoo, the single player Final Fantasy games have you controlling several characters, all of different classes and skills, fighting enemies together. Final Fantasy XIV, up to this point, was just me running around beating up enemies by myself. Unless you consider the mob-style frenzy of FATE's, the game lacked the group strategy and teamwork that I was missing. To do a dungeon run, however, teamwork is key. The Dungeons I've done required 1 Tank, 1 Healer, and 2 DPS characters. At my level, Tanks are either Marauders or Gladiators, Healers are Conjurers, and DPS characters are Pugilists, Lancers, Archers, Thaumaturges, and Arcanists. The Tank has the most armor and takes the brunt of the damage from enemies. The healer stays in the rear and keeps the party alive. The DPS characters support the Tank and protect the Healer. Additionally, it seems as if Dungeon parties communicate better as a team than the people running around the world solo. Plus, there are some really nice, "unique" items to be gained from doing Dungeons that I haven't been able to get elsewhere. And this is just from doing a "Light Party" Dungeon. I hear that there are Full Party Dungeons of 8 players, and Raids of 24 players. I bet those are crazy! On top of that, the Scions of the Seventh Dawn recently recruited me to to help save the world, and the three Grand Companies (The Maelstrom of Limsa Lominsa, The Order of the Twin Adder of Gridania, and the Immortal Flames of Ul'dah) have paid me a visit to ask that I enlist with them. I still have to listen to their speeches before deciding whom to choose, and each one is in a different city-state and offers different perks. Maybe I won't be going to Gridania after all? Decisions, decisions. Grand Companies: The Order of the Twin Adder (Gridania), The Immortal Flames (Ul'dah), and The Maelstrom (Limsa Lominsa). Then, I got an email from Square-Enix saying my free trial period with Final Fantasy XIV: A Realm Reborn will expire in less than a week! So many choices and so little time. What should I do? What else do I need to know before making my decisions? If you've got some experience with Final Fantasy XIV: A Realm Reborn, let us know in the comments below. Or, if you just want to say, "Hi," you can do that too.